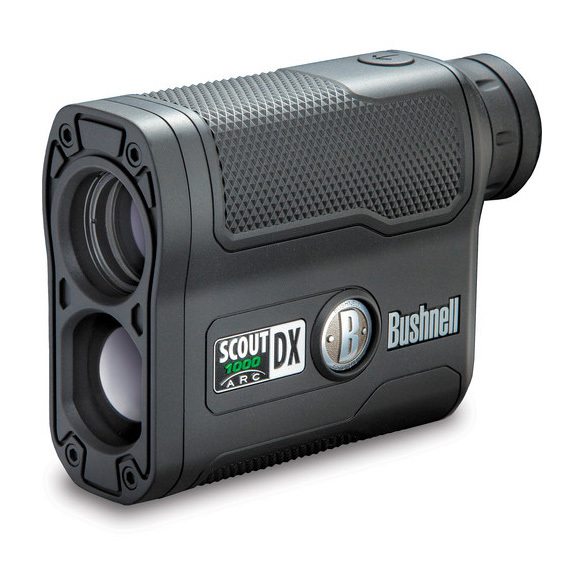 The matte black Scout DX 1000 Laser Rangefinder from Bushnell combines a laser rangefinder and inclinometer inside a waterproof housing to deliver precise distance measurements almost anywhere that adventure leads. Angle Range Compensation (ARC) technology makes this device especially useful for hunters and target shooters. In addition to a 1000-yard range and half-yard accuracy, the Scout DX 1000 includes three targeting modes to best suit the conditions of the target and is capable of rejecting unwanted readings from surrounding objects. All measurements, mode indicators, and aiming reticle are displayed on the rangefinder's in-view LCD screen. The laser emitter and receiver communicate data with an inclinometer that determines the relative angle of the Scout DX 1000 to the target. By calculating the elevation difference between those two points, the rangefinder will determine the actual distance and the required holdover values needed to reach the target. To fully integrate the experience for shooters, the built-in Variable Sight-In (VSI) feature computes bullet-drop data into useful aiming point adjustments (MOA, Mil, inch) depending on the rifle's zero. The Bow ranging mode works in a similar way, instead computing data into angle-of-elevation and horizontal distance information. A rubber armored water-sealed housing equips the Scout DX 1000 for shooting tasks in the elements.